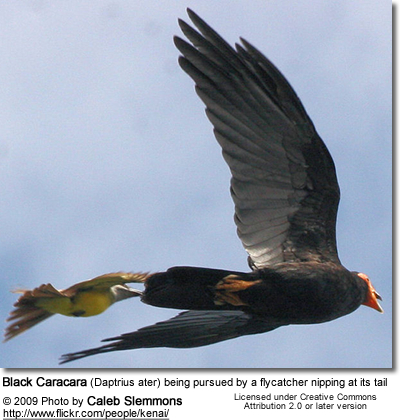 The Black Caracaras (Daptrius ater) - also known as the Yellow-throated Caracaras - are South American birds of prey. They were formerly considered congeneric (closely related) with the Red-throated Caracara based on physical similarities, such as the color of the plumage and the red facial skin. However, based on differences in vocalizations, behavior and habitat preferences, these two species were separated by C. S. Griffiths, ornithologist, in 1994. Black Caracaras inhabit the Amazon forests - with an extremely large range that stretches from the Guianas south to Ecuador, eastern Peru, northeastern Bolivia and central Brazil (south to the states of Maranhão in the eastern and northern Mato Grosso in the western part of the country. Also from eastern Colombia east through southern Venezuela. These birds are often found high in trees located near rivers, on river banks, in moist lowland forests, forest openings and newly cleared areas, as well as near ranches. They are believed to be sedentary (non-migratory). in Colombia up to 1969 meters / 600 meters where they are found east of the Andes from Norte de Santander, western Meta, and eastern Vichada southward. Populations are also believed to occur throughout the llanos in or near gallery forest. in eastern Ecuador on the lower slopes of the Andes mountain range up to 3, 940 - 4,430 feet (1,200 - 1,350 meters). in Peru, in humid lowland forests east of the Andes up to about 3,000 feet (~ 900 meters). in Suriname along forest-fringed rivers and forest roads. Avoid the cultivated coastal region. in Venezuela, where they are only regionally locally common. They usually occur in low densities, favoring lowland forest borders and deforested areas up to about 1,000 feet (~ 300 meters). In the French Guiana, these birds are rare and localized. Less than 100 of them are believed to still exist in forests along some larger rivers, such as the Litani River near Mana from the far south to the estuaries. Black Caracaras measure 16.5 - 19 inches (~ 42 - 48 cm) in length, including the tail. The plumage is shiny black except for the rump and base of the tail, which are white. The bare facial skin is red, and the throat and legs are yellow. The similar Red-throated Caracara can be identified by the white abdomen. Black Caracaras eat just about anything they can get hold off - including eggs, nestlings and fledglings of other birds (such as caciques, flycatchers, pigeons, and even other birds of prey), small mammals, smaller birds, carrion (dead flesh), frogs, reptiles, insects, spiders, caterpillars, small fish picked up from shallow waters, as well as dendê nuts and fruit. They have been observed eating ticks and other parasites of deer and tapirs. The tapirs are said to call them, lay down belly up allowing the Caracaras to pick the ticks off them. They are also known to scavenge at campsites. 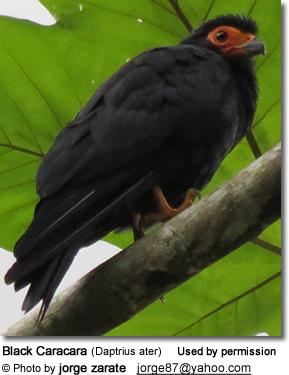 Black Caracaras usually nest in the crowns of trees or - depending on their habitat - in the top of palms. The average clutch consists of 2 - 3 white eggs that are suffused with reddish-brown pigments. The smallish nests are constructed out of sticks.